The wacky intro sequence puts you right in the mood for this funny sci-fi themed slot from online slot developer, Ash Gaming. At the start of Time Machine we see a goofy-looking scientist and his glamorous assistant preparing to fire up the time machine and go back in time to hunt out valuable antiquities to sell on. And if you play your timelines right you could be counting the riches too. 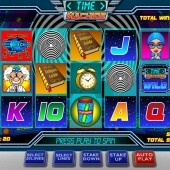 Across five reels and 20 paylines, Time Machine is all about sci-fi icons and a great bonus feature. On the reels, as well as some cosmic-colored 10-through-Ace symbols, we get the Scientist, his assistant, a time machine, alarm clock and antiques catalogue. The Wild in the game is the Time Machine logo, and that substitutes for all symbols other than the Scatters. Five Wilds across the reels pays out a sweet 10,000-coin jackpot. And with betting stretching from a friendly $0.01 to a meatier $10 that can make for some lovely big prizes. 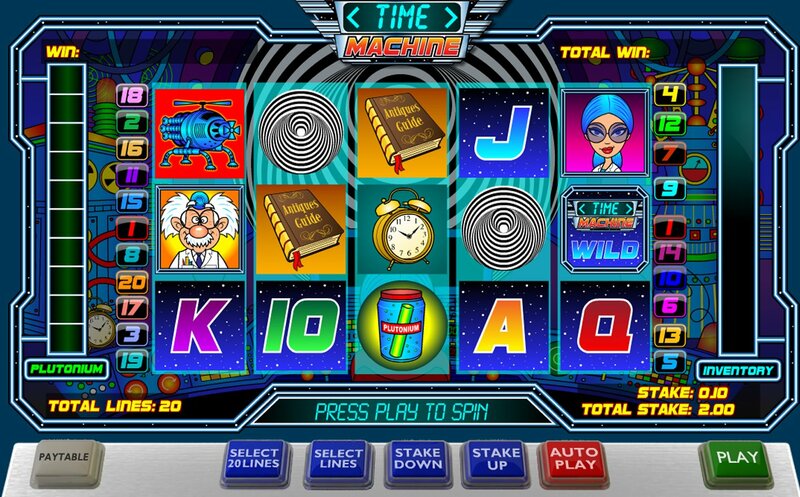 The game’s bonus feature is the biggest reason to play Time Machine, however. Hit three or more Wormhole Scatters anywhere across the reels and you’ll take a trip back in time to hunt down those priceless artifacts. You’ll need some plutonium to power your machine first, however, and you can build that up by hitting Plutonium Scatters on the reels. Look out for the Energy bars on the side of your screen – here you’ll be able to track how much energy you have left. Once you have 10 Plutonium bars you’re ready to time-travel. There are four different time zones to travel back to and explore, including a prehistoric ‘Dinosaur Egg’ bonus that kicks everything off, a Roman-themed ‘Chariot Race Bonus’, a Battle of Trafalgar-set ‘Battleship Bonus’, and a 1960s-set ‘Psychedelic Spotlight Bonus’. The Dinosaur Egg Bonus is a straight Pick ‘em Bonus with six eggs to choose from. Choose well and multipliers up to 30x can be yours. Your next stop on the Time Machine Express is an afternoon at the Colosseum – pick a chariot in the race and you can win 40 coins with a 30x multiplier. Next, travel to the time of Nelson and Napoleon and see some big ships take each other out. There’s a little skill involved here, with you having to aim your target at the ships (you can shoot up to 14) to earn prizes. Finally, the time machine stops in the 1960s and a groovy, psychedelic party. Each time the spotlight stops on a funky dancer you’ll win a cash prize. Once you’ve worked your way through the timezones you’ll have the chance to auction off your collected historical artifacts at the auction. Choose the order of four objects to auction off, with varying cash prizes on offer. There’s certainly lots to enjoy in Time Machine. The graphics are nice, the FX and voiceovers effective, and the bonus round really meaty. It’s a slight worry that to start the bonus feature you not only have to fill up the Plutonium but also then trigger three Wormhole Scatters as well, but I did find that meter filling up pretty regularly. In summary, then, Time Machine is a great all-action game that sci-fi fans will surely lap up. For similar sci-fi and futuristic-themed slots gaming, you might want to check out NetEnt's quirky Space Wars slot or Play'n Go's intergalactic-set Space Race slot.